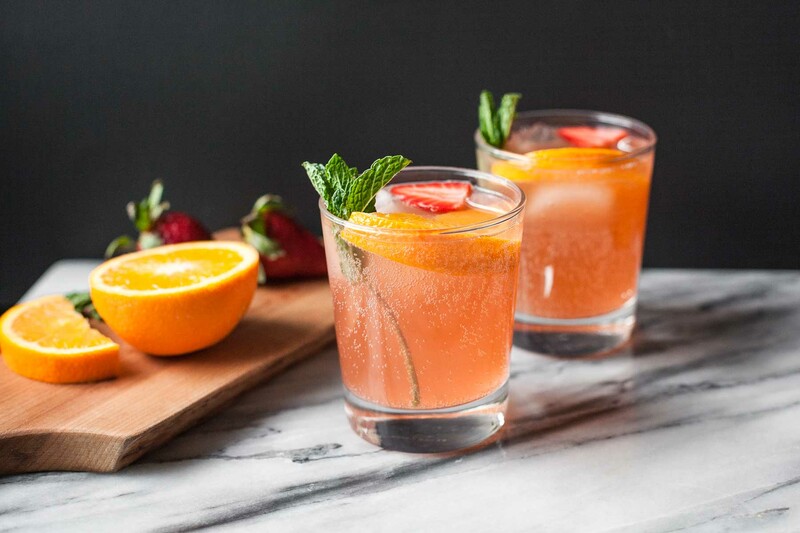 This strawberry orange ginger fizz is the perfect spring mocktail or cocktail. 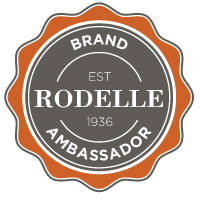 It’s sweetened with honey, so it’s paleo friendly and free of refined sugar. I love a good pink drink, and this strawberry orange ginger fizz is the one I can’t stop sipping on at the moment. 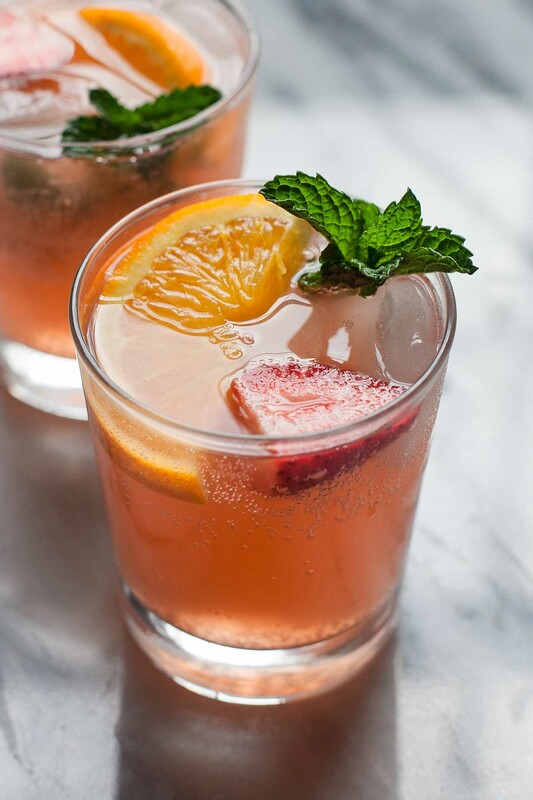 It’s a mix of wintry citrus and springy strawberries, so it’s the perfect way to toast the bridge between the seasons, and the ginger gives the drink just the right amount of bite. I’ve gotten to the point where I find a cocktail boring if just tastes sweet and has no other flavors. The ginger cuts through the fruit and honey here to create a taste that’s not only sweet and delicious, but also intriguing. And of course, the bubbles help with that, too. The syrup for this drink takes less than 15 minutes to make and keeps for a week or so in the fridge. So if you make the syrup ahead of time, all you need to do when you’re ready to serve is spend two minutes chopping an orange and some strawberries and one minute mixing the ginger fizz itself. It’s so easy, and so good! Why not invite a few friends over for an impromptu drink to celebrate spring? Blackberries are my favorite fruit, and they are so delicious this time of year. In addition to eating blackberries & dark chocolate for breakfast, I’ve been using them to make this amazing mocktail/cocktail, the blackberry smash. I was going to call it a blackberry fauxjito, but blackberry smash is just so much more fun to say. In addition to being fun to say, it’s really fun to make and drink. When I have a party, I like to offer one special, seasonally-inspired cocktail that I can make for my friends all night long. I’m not a very proficient bartender, so I don’t want to offer a bunch of different things, but I’ve found that having one unique drink makes a gathering way more glamorous and fun. At Thanksgiving this past year, I had ten people over, and was prepared with several different kinds of wine and beer, as well as the ingredients for cranberry margaritas. The margaritas were such a hit that I don’t think we opened a single bottle of wine–no one could say no to a creative libation based on fall’s quintessential berry.